As parents we are constantly learning and adapting to ensure our children are given the best possible chance for optimum health. This can be exhausting at times, it feels like I am always on the hunt for ways to improve their nutrition and my girls aren’t always on board with my ideas. Can’t imagine why they don’t want steamed broccoli every night…..
One of the challenges I faced early on was drink choices. I’m sure most parents have hit that moment when you realized your child wants sweet juices over water and you are faced with the dilemma of having to find nutritious juices that won’t rot your kids teeth or jam their little bodies with unnecessary sugar. Finding the juices with 100% juice and the vitamins we want is like striking gold, just one of those good moments. In our house we tend to reach for Oasis juices, they have a wide assortment of products and flavours which make it easy to please everyone. Their website has all of the nutritional information and benefits available in a transparent manner. Oasis Classic is one that is always in the fridge. My aging Father has taken to the Oasis Classic 100% Orange Juice. It has no sugar added and is a great source of Vitamin C.
My children love Oasis Smoothies, you know we’re smoothie fans so I had my doubts about one that is pre-made but must admit it’s nice to grab a carton out of the fridge and serve with no effort. There are 5 flavours, all of which are made from ripe fruit purée and juices, these creamy blends contain two daily portions of fruit in each glass (250 ml) and a good dose of vitamin C too. If I could choose just one product from the Oasis line it would be Oasis Nutrisource. These are low calorie delicious juice blends with antioxidant vitamins C & E or polyphenols. This fruit juice cocktail provides the wonderful flavours of wild berries and pomegranate with only 40 calories per serving. What a refreshing way to get healthy! With no added sugar, sucralose or aspartame, one 250 ml glass is a good source of antioxidant vitamins C and E.
As I said, the Oasis website is a wealth of information in regards to nutrition so head over there and check it all out. You can follow Oasis on social media too, here are their Pinterest, Twitter, Facebook and Instagram accounts. 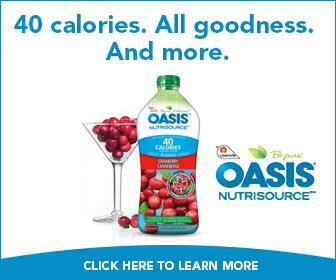 Oasis Nutrisource is having a contests, 10 winners will receive a $1000 shopping spree! It’s simple, head HERE and enter your information. You’ll receive a $1 off coupon and be entered to WIN. How great is that? 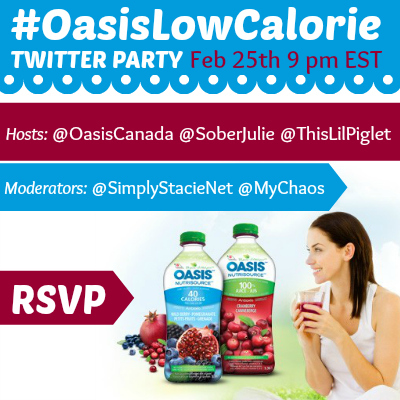 For a chance to win at the party, RSVP below and please follow your #OasisLowCalorie party hosts and moderators. Then, jump on Twitter using the hashtag at 9pm EST on February 25th.